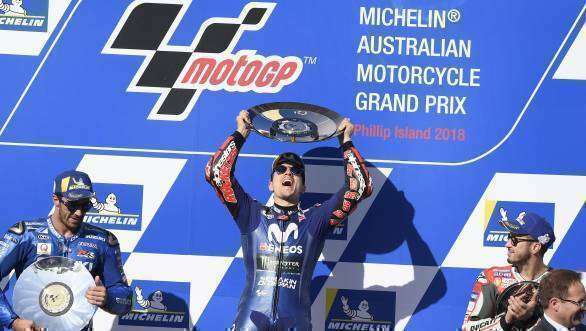 Maverick Vinales took a commanding win at the 2018 MotoGP round at Phillip Island, putting an end to his rather long time away from the top step of the podium. He also put an end to Yamaha's long time without a victory, with their last win being the 2017 Dutch TT courtesy Valentino Rossi. 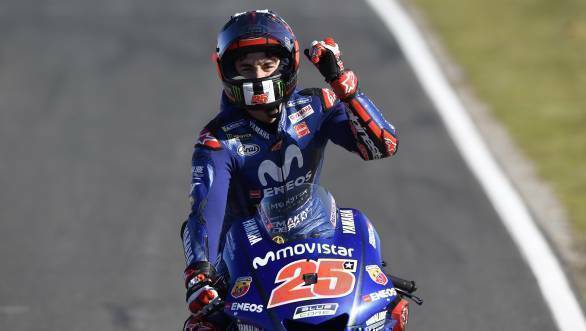 Vinales won the race ahead of Suzuki Ecstar's Andrea Iannone and Ducati's Andrea Dovizioso. 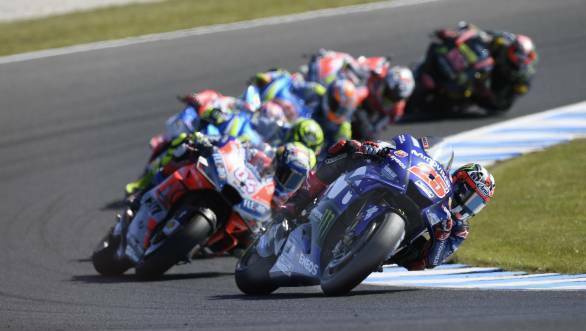 It was a tricky start to the Australian round of MotoGP for Vinales, with the Yamaha rider dropping down the order on the first lap. But over the course of the next few laps, he steadily worked his way back up the order, moving into the lead on the eighth lap. He was followed on track by Yamaha team-mate Rossi. Vinales managed to build up a solid lead up ahead, which meant that he was quite comfortably off at the head of the pack. Behind him, there were scraps up and down the order. However, the highlight of the race was the rather frightening crash between Johann Zarco and Marc Marquez, which occurred on the race's sixth lap. The Monster Yamaha Tech 3 ran into the rear of Marquez's Repsol Honda at a speed of 300kmph. Zarco was flung off his Yamaha, but ultimately was able to escape uninjured. Marquez managed to make it back to the pits and into retirement. Up ahead, though, it was Iannone and Dovizioso who were battling it out for second place (having managed to get past Rossi), although it was Iannone who ultimately came out ahead. Alvaro Bautista, filling in for an injured Jorge Lorenzo, managed to get fourth place. Alex Rins took fifth, having overhauled Rossi on the last lap. Behind Rossi, Jack Miller ended the race seventh. Franco Morbidelli ended the race eighth, while Aprilia's Aleix Espargaro ended the race ninth. Bradley Smith rounded off the top 10 for Red Bull KTM.